Got my organics delivery from Boston Organics yesterday....this post is suplemented with photos from google image. My camera battery arrived, but after my produce delivery so I didn't get to photograph my haul. I also added on some cranberries so I can make cranberry oat bars, and some brussel sprouts, because we all know how I feel about those...YUM! The names of the products I've never actually cooked before are listed in bold. 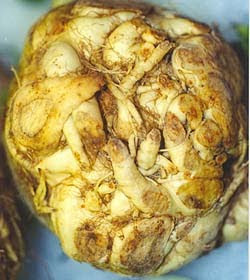 The celery root is downright scary looking. The brussels have already been eaten, roasted, of course...and I wanted oven fries too - but didn't have any potatoes. So I pretended one of the turnips was a potato and roasted that too. 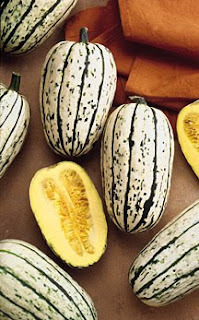 I've never use a delicata squash before -but I think its so pretty. I almost feel bad eating it. But not too bad, because I LOVE squash. I'm not totally certain what I'll do with this, so any suggestions are appreciated! Not sure what I'm going to do with these...maybe use them as a garnish in a salad or the celery root soup? Anyone with suggestions please leave a comment! I think you can cut the delicata squash into about 1-inch thick rounds horizontally and roast those with some spices. And I made a great celery root soup a while ago - found the recipe on Orangette! Actually... you could ask people on Twitter about the sprouts... you'd probably get a ton of suggestions that way. Great Idea Megan! I actually posted on both Twitter and Facebook. We'll see if anyone has any tips. Otherwise I might just throw them in a salad and call it lunch. methinks they might be delicious in a stir-fry tpye dish. and if you want to make it bizen-style, you could maybe add some tofu? hey, do you have any recommendations about how to serve spaghetti squash? i bought one to make for dave cause he's never seen one before, but then i realized i have no idea what to do with it. any ideas, self-proclaimed squash-lady? Celery alone is scary enough ;) but the celery root does look quite intense! I've gotten a couple suggestions of stir-fry. I was planning on making tofu tikka massala tonight - so I'll maybe throw them on top of my quinoa side. I bet that will be a nice addition...Bizen, I will send you a separate email regarding the spaghetti squash - very delicious! My first experience with the munchin' Mix was through Boston Organics as well. There are a few recipes on Jonathan's organic website. I tried the spanish rice recipe...it was pretty good. With my delicata squash I made squash fries. I have also used the squash in hot pots, soups, and mashed. I find that anything you can use a butternut squash or a pumpkin for, you can probably use a delicata. Don't forget to save the seeds and roast them too! 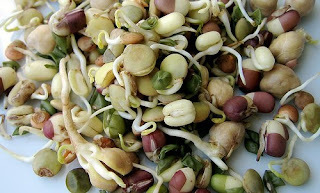 I got those mixed sprouts too. I just snacked on them, and put them on hummus sandwiches.